Does a schefflera need a small pot? Does it like it tight or room to grow? 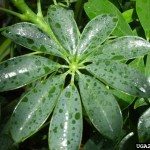 I have a small schefflera. It needs to be repotted. How big or small? It will winter indoors.